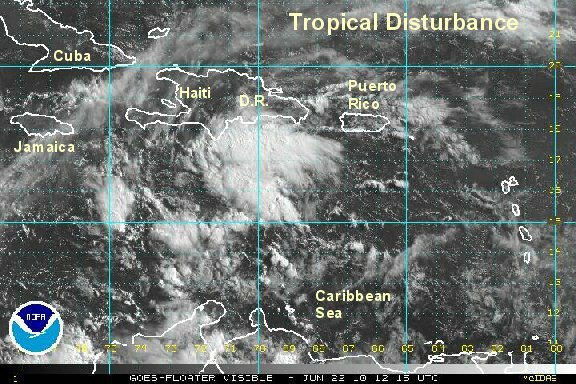 A tropical disturbance is slowly becoming better organized in the central Caribbean. Heavy showers and storms are south of Hispaniola. Winds aloft are weak and favorable for increased organization. 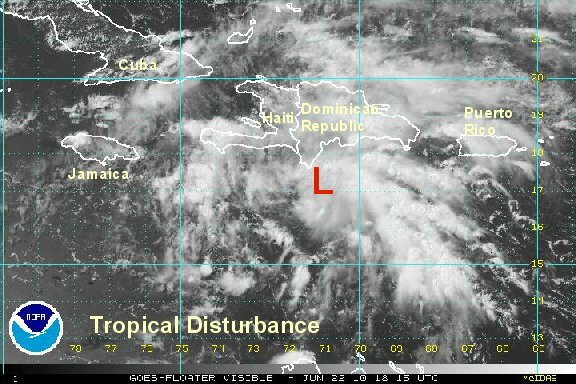 Although no circulation center is noted yet on satellite imagery, one may form with the increased unsettled weather. Do not panic! This system still may not organize and its future path is uncertain. Early forecasts suggest that the low will move toward the northwest Caribbean over the next 3-4 days. 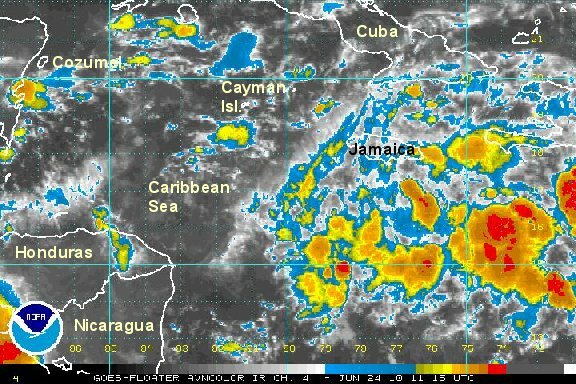 The unsettled weather south of Hispaniola remains disorganized. Visible satellite imagery shows what appears to be a mid level, but no surface low is apparent. Early forecasts suggest that the low will move toward the northwest Caribbean over the next 3 days. 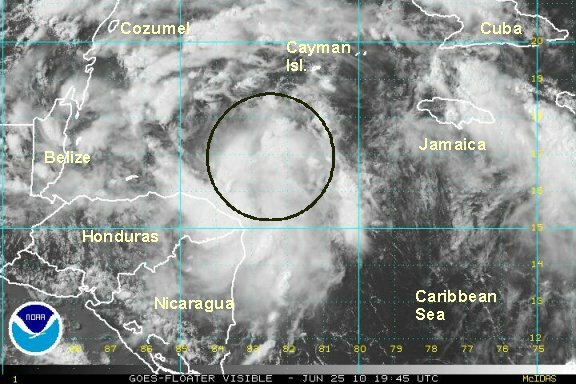 Even though weather remains unsettled in the central Caribbean, no organization to the convection is apparent. We will continue to monitor the situation. A large upper air trough is north of the Caribbean. Anticyclonic windflow into the Caribbean aloft is creating a large area of unsettled weather. Heavy showers and storms range from near Jamaica to south of the Dominican Republic to near the Leewards. No surface low has organized at this point. A surface low pressure system is finally trying to organize between Honduras and the Cayman Islands in the western Caribbean sea. A hurricane hunter recon has been visiting and so far has not reported a vortex although a south wind of 30 knots has been found. It is very possible that NHC will call this a tropical depression at 5 pm, even though a closed low has not been found yet. Forecast models have been hinting for several days now that some type of low will develop, then move into the gulf of mexico. All interests in the Gulf of Mexico and western Caribbean need to follow this tropical system. After many days of disturbed weather in the Caribbean a tropical depression has finally formed. Forecast models eventually take this system into the Gulf of Mexico..... A scenario that many have dreaded with the oil spill. Tropical depression 1 will become the first named storm before making landfall on the eastern side of the Yucatan peninsula by Saturday evening. 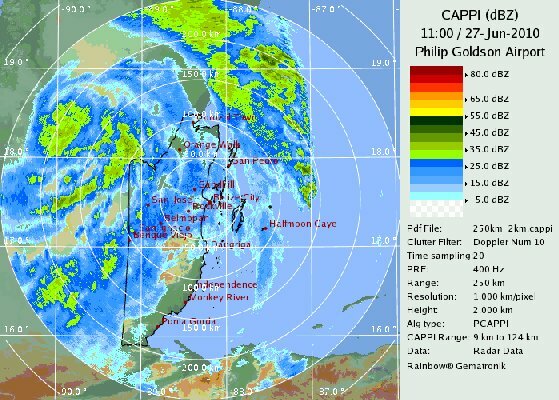 It will weaken as it passes over land. Once in the western Gulf it will restrengthen again early next week. 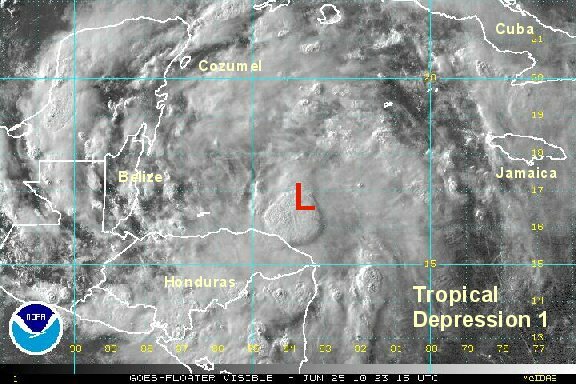 At 8 pm edt / 7 pm cdt tropical depression 1 was centered at 16.6° N / 83.7° W or about 345 southeast of Cozumel, Mexico. It is moving west northwest at 10 mph. Top sustained winds are 35 mph (NHC 35 mph). Pressure is 1004 mb. 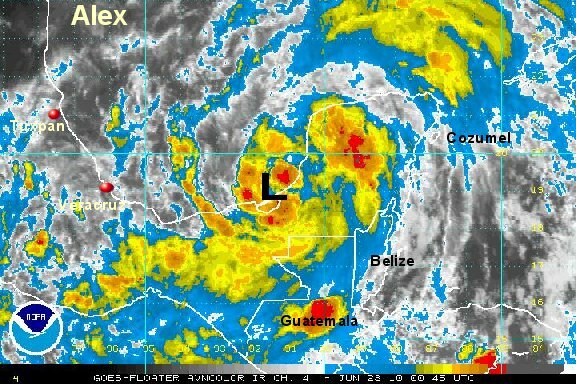 Satellite imagery shows a large area of deep convection gowing north of Honduras. The hurricane hunter plane also found winds of 35-40 knots. This suggests that surface winds are at least 40 mph at this time. An upper level high pressure system is forecast to be over Alex as it moves generally west northwest the next several days. This will keep wind shear light. Additional strengthening is likely before Alex makes landfall late this evening. At 5 am edt / 4 am cdt tropical storm Alex was centered at 16.9° N / 84.9° W or about 220 miles east of Belize City. It is moving west northwest at 8 mph. Top sustained winds are 40 mph (NHC 40 mph). Pressure is 1004 mb. Forecast models are in general agreement to take Alex over the Yucatan peninsula, then into the Bay of Campeche / southwestern Gulf of Mexico. Several days from now a second landfall is possible on the northwestern coast of Mexico south of Texas. All interests in the Gulf of Mexico and northwestern Caribbean need to follow this tropical system. 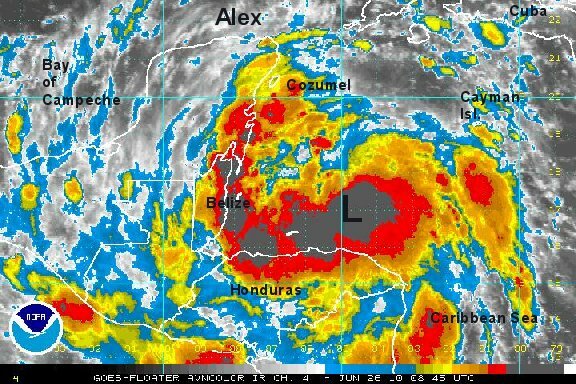 Tropical Storm Alex will be making landfall on the Belize coast this evening. Some gusty winds with gusts to over 50 mph and heavy rainfall of 5-10" will be the main impacts. At 2 pm edt / 1 pm cdt tropical storm Alex was centered at 16.9° N / 84.9° W or about 75 miles east of Belize City. It is moving west northwest at 9 mph. Top sustained winds are 45 mph (NHC 45 mph). Pressure is 1003 mb. 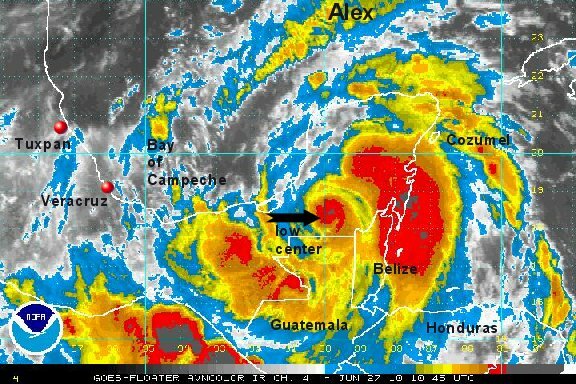 Tropical Storm Alex has strengthened and is currently on the coast of Belize. Winds were derived from the hurricane hunter. Maximum flight level winds were about 59 knots. We think that surface winds of 55-60 mph is more representative of the strength and are going lower than NHC's estimate. At 8 pm edt / 7pm cdt tropical storm Alex was centered at 17.4° N / 88.1° W or about 15 miles southeast of Belize City. It is moving west northwest at 9 mph. Top sustained winds are 60 mph (NHC 65 mph). Pressure is 996 mb. Forecast models are are farther south, taking Alex over the Yucatan peninsula, then into the Bay of Campeche / southwestern Gulf of Mexico. Several days from now a second landfall is possible 100-200 miles south of Texas in northeastern Mexico. Alex has held together remarkable well overnight. The center of circulation is still holding together and should be over water again by this afternoon. Because of the little damage done to the structure while over land, we expect Alex to restrengthen quickly and most likely become a hurricane before its second landfall on the northeastern coast of Mexico in a few days. 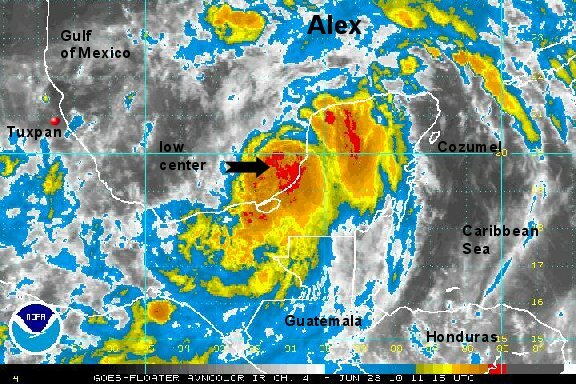 At 8 am edt / 7 am cdt Alex was centered at 18.4° N / 89.9° W or about 110 miles south southeast of Campeche, Mexico . It is moving west northwest at 12 mph. Top sustained winds are 40 mph (NHC 40 mph). Pressure is 996 mb. A heavy band of rain continues south of the resort areas of Cozumel and Cancun, although a smaller band is near both locations. Rainfall amounts of 5-10 inches + is possible from tropical storm Alex. Forecast models have not changed much taking Alex into northeastern Mexico, south of the Texas border by the middle of this week - about 3-4 days from now. 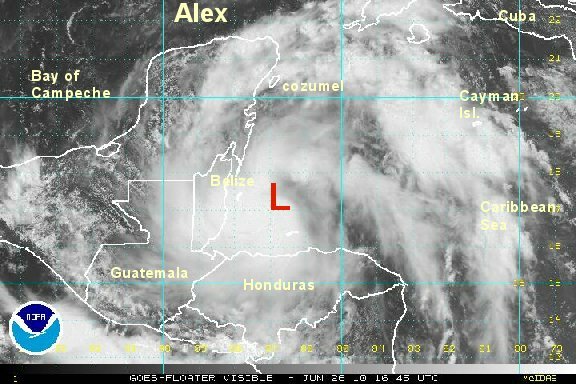 All interests from the Yucatan peninsula to northeastern Mexico and extreme southern Texas should follow Alex closely. Alex looks much weaker as it nears the coast of Mexico. Redevelopment is likely once it moves over the Bay of Campeche soon. 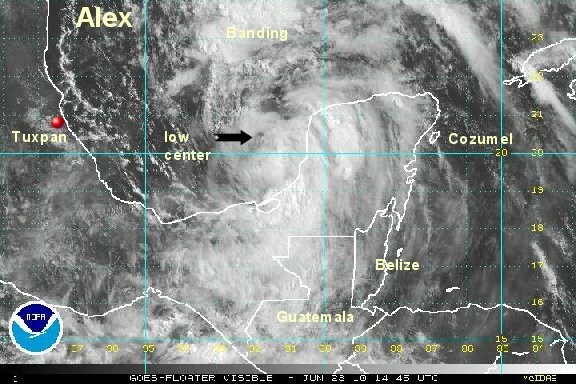 At 3 pm edt / 12 pm cdt Alex was centered at 19.0° N / 91.0° W or just northeast of Sabancuy, Mexico. It is moving west northwest at 12 mph. Top sustained winds are 30 mph (NHC 35 mph). Pressure is 1000 mb. All interests in northeastern Mexico and extreme southern Texas should follow Alex closely. 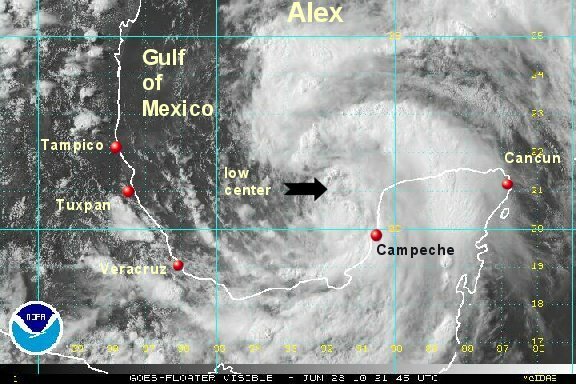 Alex is now in the Bay of Campeche just offshore of the coast of Mexico. Deep convection has quickly built around the center of circulation and it is likely that Alex will be classified as a tropical storm tonight. 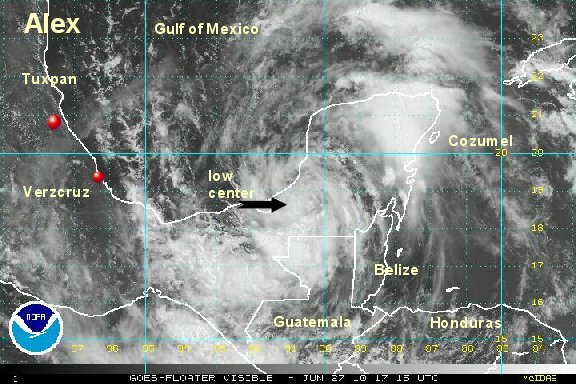 At 10 pm edt / 9 pm cdt Alex was centered at 19.2° N / 91.3° W or just off the coast of Sabancuy, Mexico. It is moving west 9 mph. Top sustained winds are 40 mph (NHC 35 mph). Pressure is 999 mb. Alex has only been drifting overnight. If appears that the motion is initally north, but should take on a more northwesterly motion soon. Slow strengthing has been noted from the reports from the hurricane hunter. Deep convection has surrounded the center of circulation. More significant strengthing will occur as Alex moves away from land today. 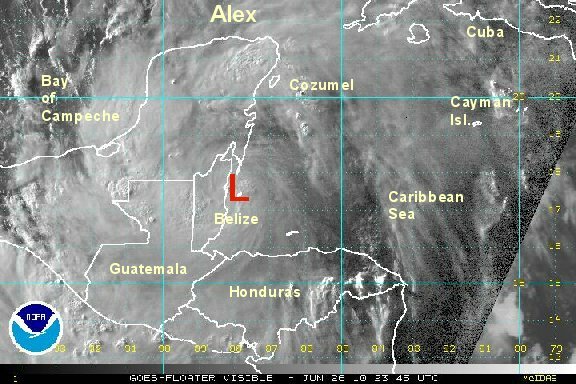 At 8 am edt / 7 am cdt Alex was centered at 19.8° N / 91.6° W or about 75 miles west of Campeche, Mexico. It is moving north at 5 mph. Top sustained winds are 50 mph (NHC 50 mph). Pressure is 990 mb. Forecast models take Alex generally northwest for the next two days. After this some models are farther north, with a landfall in south / central Texas versus northern Mexico. Due to light wind shear conditions, Alex will have the time to strengthen into a hurricane before landfall. All interests in northeastern Mexico and Texas should follow Alex closely. The hurricane hunters have found a flight level wind of 66 knots, but have the surface wind at 43 knots. Looking at the satellite imagery, we think that the 43 knots wind is a better estimate and that NHC is a little strong. Remember - a 60 mph sustained surface wind means that gusts to 70 mph should be found. we don't think that this is the case at this time. At 12 pm edt / 11 am cdt Alex was centered at 20.4° N / 91.7° W or about 530 miles southeast of Brownsville, Texas. It is moving north northwest at 7 mph. Top sustained winds are 50 mph (NHC 60 mph). Pressure is 990 mb. Alex has been slowly organizing today. The hurricane hunter recon from earlier today had simply 41 knots estimated, indicating that our estimate of 50 mph was probably a little generous (and NHC's estimate 60 mph more so). Deep convection is now starting to build near the center of the low and a large spiral band has formed to the northeast. More significant development is likely overnight as the low slowly pulls north away from land. It also appears that Alex is moving a little east of due north compared with official motion of nnw. At 7 pm edt / 6 pm cdt Alex was centered at 20.5° N / 91.5° W or about 530 miles southeast of Brownsville, Texas. It is moving a little east of due north at 5 mph. Top sustained winds 50 mph (60 mph NHC). Pressure is 990 mb. Forecast models take Alex generally northwest for the next two days. Forecast models still have a landfall range between northern Mexico and south Texas Wednesday.